Satellite images indicate the tropical wave located about 1200 miles east-southeast of the Windward Islands has continued to become better organized. Environmental conditions appear favorable for additional organization to occur...and a tropical depression could form later today or on Saturday. Interests in the Lesser Antilles and eastern Caribbean Sea should closely monitor the system for next several days as it moves west-northwestward at about 15 mph. This one will not be a fish system as TD#4 wlll be and all interests in the islands should watch the peogress of it. Cycloneye, do you think this system will have a similar track to the one Charley had through the Caribbean or this system will be someting different? Also, do you think TD #4 will be a fish or not? Well i think this system will track though the caribbean like charley did as that atlantic ridge going to build back in. Now with TD 4 the national hurricane center has the track the first 72 hours as a WNW track to NW track, then after that they bend the track back to W to WNW agan. My tracking pen needs a vacation. I've stated this MANY times.....ALL my prayers are going out to those of you in the strike zone...."PLEASE take care!" I was checking out the GFS last night, and this must be the system that it had near Hispaniola in a week or so. Strong high pressure was forecast along the Atlantic coast, which could keep it moving WNW. Would there be any maps available for TD5 yet? cycloneye wrote: This one will not be a fish system as TD#4 wlll be and all interests in the islands should watch the peogress of it. Cycloneye, I would suggest you never say never. Yesterday, I talked about the pattern not being right for this thing to turn away. This one (TD4) MUST be watched because all indications right now are that the subtropical ridge will strengthen and head later on westward. I told you yesteday to NOT let your guard down....I hope you haven't. why do you say TD4 will be a fish but TD 5 won't be? First advisory on TD#5 at 5 PM. Where are the people who were saying the season will be a weak one??? 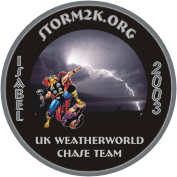 Hyperstorm I deleited one of your double posts but with the site so sow both went gone so post yours again. especially since td 5 will probably strike land!!! Yep. Looks liek td5 will wind up in the GOM eventually. 1045 miles...1680 km...east-southeast of the Windward Islands. the depression could become a tropical storm by Saturday. Looks like the busy times will continue. tropical storm and be near Jamaica in 120 hours as a hurricane. Caribbean Sea in days 4 and 5.